^ 建立時期はアウグストゥスが紀元前16年に行ったこの地方への記録にない旅に基づいている。James C. Anderson, Jr., "Anachronism in the Roman Architecture of Gaul: The Date of the Maison Carrée at Nîmes" The Journal of the Society of Architectural Historians, 60.1 (March 2001), pp. 68-79. ^ ニーム市の建築監督 Marc Célié が1990年から1991年に行った発掘調査で判明。 (Anderson 2001:75). 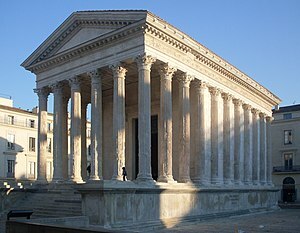 ^ Pierre Pinon, "Le projet de Norman Foster pour la médiathèque de Nîmes face à la Maison Carrée", Archaeology, 1985. ^ Roth, Leland M. (1993). Understanding Architecture: Its Elements, History and Meaning (First ed.). Boulder, Colorado: Westview Press. pp. 414. ISBN 0-06-430158-3. ^ J.-C. Balty, Études sur la maison carrée de Nîmes (Brussels) 1960. Wheeler, Mortimer (1964). Roman Art and Architecture. Thames and Hudson. ISBN 0500200211. Stierlin, Henri (2002). The Roman Empire: From the Etruscans to the Decline of the Roman Empire. Taschen.